Image Armor ULTRA has a faster gel time for white ink than other pretreatments. This allows for faster printing & "One-Pass" printing. Typically you can reduce the amount of ink applied resulting in brighter images and cost savings. Greatly reduced crystallization on the shirt results in better looking garments and smoother prints. Increase the wash fastness of any ink set with Image Armor Pretreatments. Improves washability of the printed image making them look better - longer. The application window is blown wide open - no worrying if the ink will stick after washing. 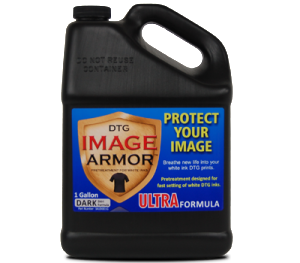 The latest addition to the Image Armor line of pretreatments is the new ULTRA formula. ULTRA allows for the faster setting or gelling of white DTG ink sets that are different than the standard Dupont inks. The new ULTRA opens new doors for direct to garment printers who are printing with Dupont® inks or are printing with the Epson F2000 DTG printer. Designed to work and gel the white inks for NON-Dupont® ink sets (Epson, DTGTex, etc) allows for faster printing speeds that require a “hotter” pretreatment to gel the white ink prior to printing the CMYK layer. Image Armor ULTRA is designed for mid-dark colors to black garments and continues the legacy of the original Image Armor formulas. You DO NOT need to mix down Image Armor. It is ready to use (RTU) right out of the container. Always SHAKE the container before using or pouring into your pretreatment machine container. When returning unused pretreatment from a machine, strain it to ensure no fibers or dirt, dust, contaminants are in the solution. A clean solution keeps you happy. When applying pretreatment to the garment, make sure to apply it as evenly as possible (mechanical pretreatment machines are the best). Depending on the shirt being pretreated there are some variables to consider on how much to apply. A good starting point is 15-18 grams per 14″x14″ area. NOTE: 18-26 grams may provide you with better washability and white optical brightness. Test to find your best laydown for the garment you are pretreating. Application amounts will vary based on the weight and quality of the garment being printed. The heaver the garment, the higher the amount of pretreatment needed. The darker the color, the more pretreatment is required. The lighter the weight of the shirt, you can usually reduce the amount of fluid applied to the garment. The lighter the color of the shirt, less pretreatment is usually required. HINT: You might try cutting ULTRA for LIGHT colored shirts with a 1:1 mix (using one distilled water to one pretreatment) to reduce yellowing or discoloration. DO NOT USE on white or natural colored shirts. Always use a high quality garment that is ring-spun with a tight knit weave. The smoother and tighter the weave, the better your final DTG print. Cure time: 30 seconds or until dry. You might try two 20 second presses. Use brown KRAFT paper for best results. Teflon can result in a glossy sheen. Kraft paper should be easily removed and not stick to the shirt when peeling. Sticking will result in fibers sticking up resulting in non-smooth white prints. Pressure setting: Heavier pressure can be used and will help press/mat down fibers during the drying process. DO NOT allow cover sheet to remain on garment after pressing or crystallization can occur as pretreatment vapors cool. Pre-pretreated shirts can be done ahead of time. Try to use them as soon as possible. It is not recommended to go more than two weeks after pretreating before using. Always re-press the garment for 5-10 seconds with light pressure if they’ve been stored for more than a day. The shirts will collect moisture, and moisture is the enemy of good pretreated shirts. ALWAYS MAKE SURE YOUR SHIRTS ARE MOISTURE FREE BEFORE PRINTING. DO NOT OVERHANDLE the shirts. Touching, bending, folding, throwing shirts around will damage and break the pretreatment down on the shirt. For the best results, try not to “man handle” the garments prior to printing.